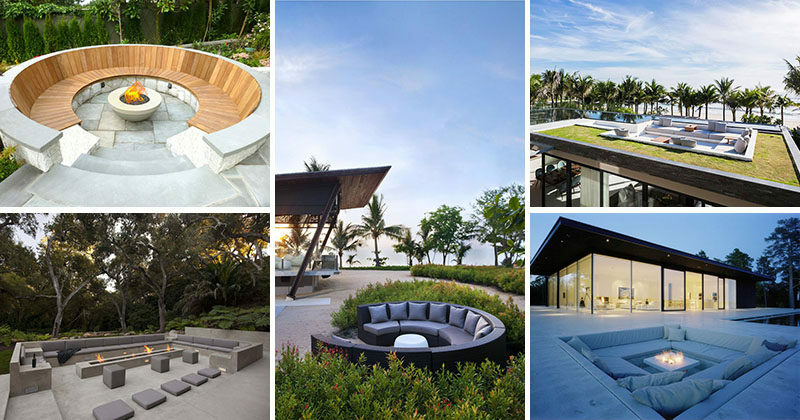 Here are 15 stunning examples of outdoor conversation pits. 1. 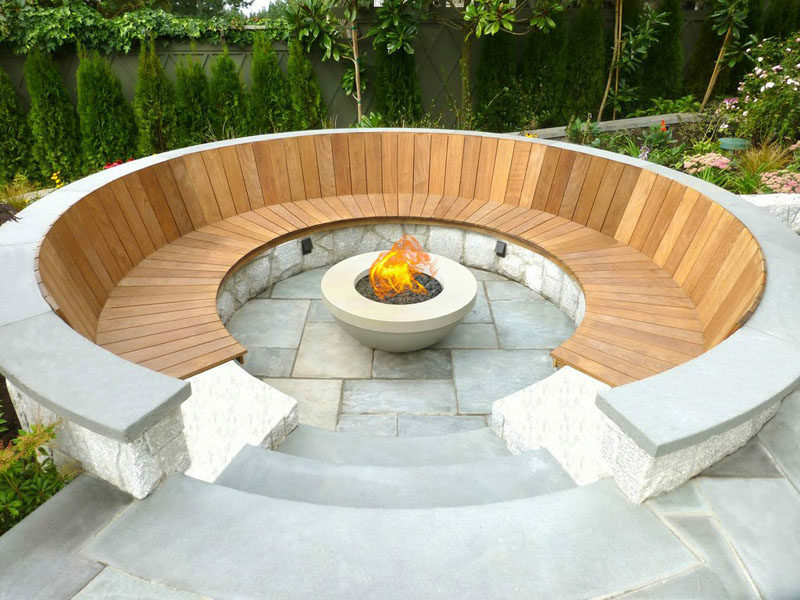 Stone and wood circle this fire pit and create a warm atmosphere, perfect for catching up with old friends. 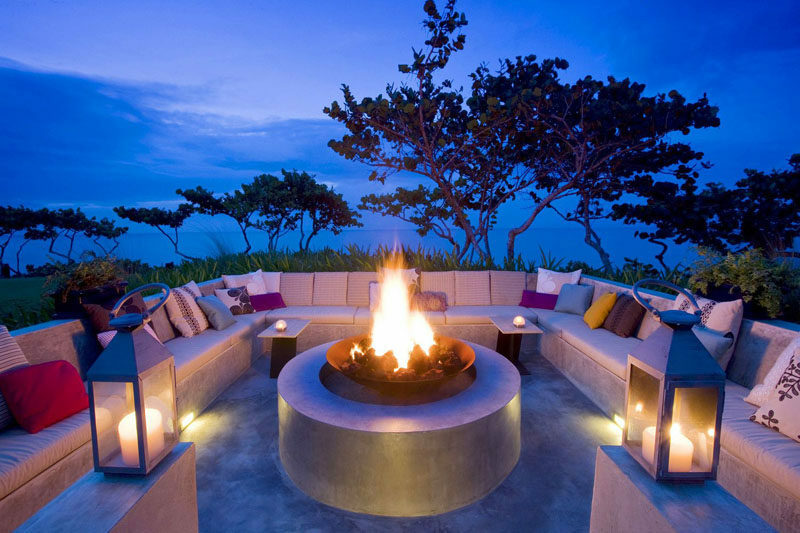 Conversation pit featuring the Sultan Fire Pit by DreamCast. 2. 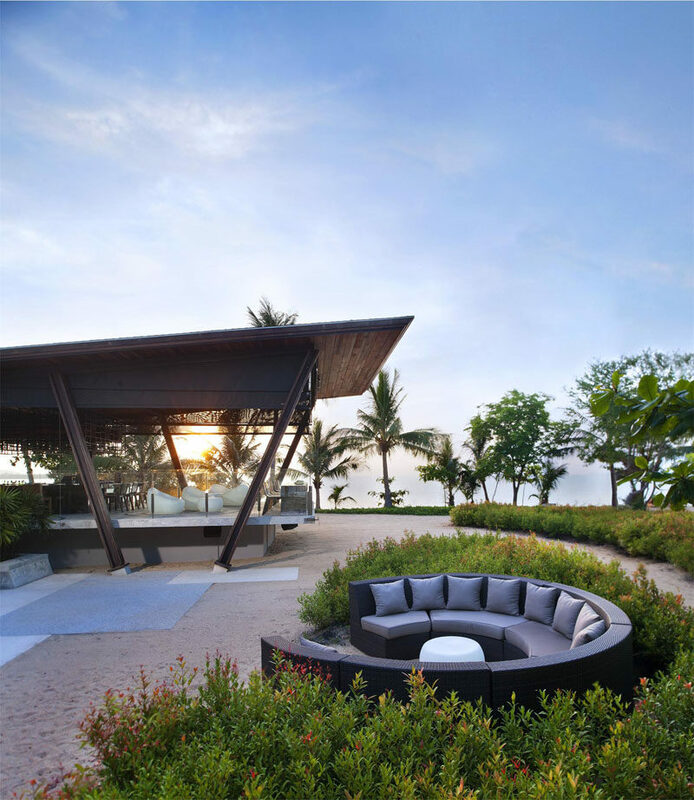 Surrounded by sand and bushes, this conversation pit is ideal for relaxing after spending the day in the sun. See more photos of this project, here. Designed by MAPS Design. 3. 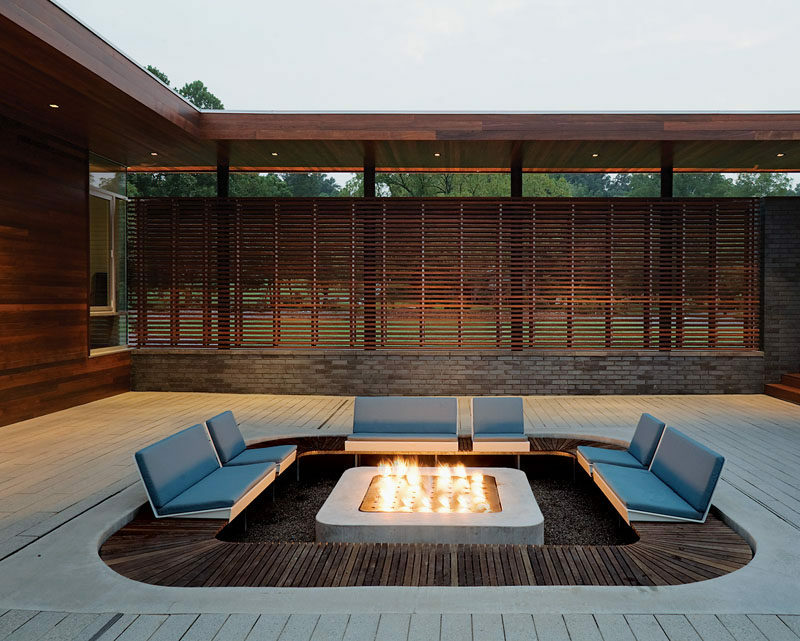 Built right into the deck of this home, a sunken firepit adds a modern cozy touch to the entertaining area. See more photos of this project, here. 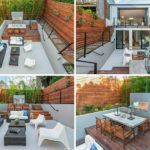 Designed by Hufft Projects. Photography by Mike Sinclair. 4. 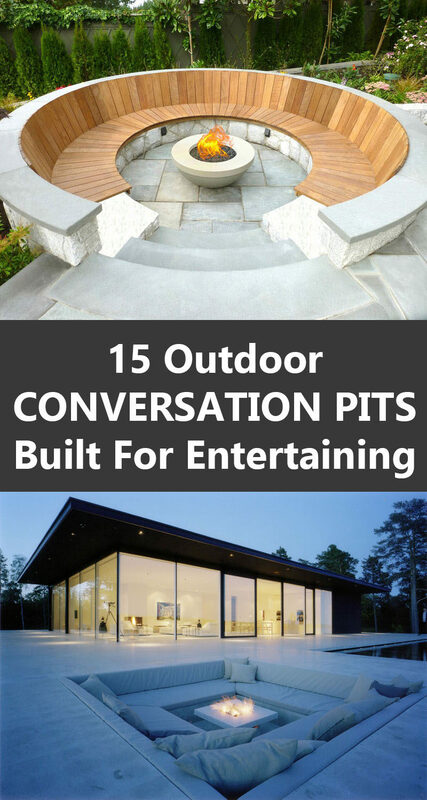 Complete with a built in fireplace, wood storage, and a cooler, this sunken conversation pit would be great for both social gatherings and quiet afternoons tucked up with books. 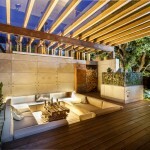 Designed by Rolling Stone Landscapes. 5. 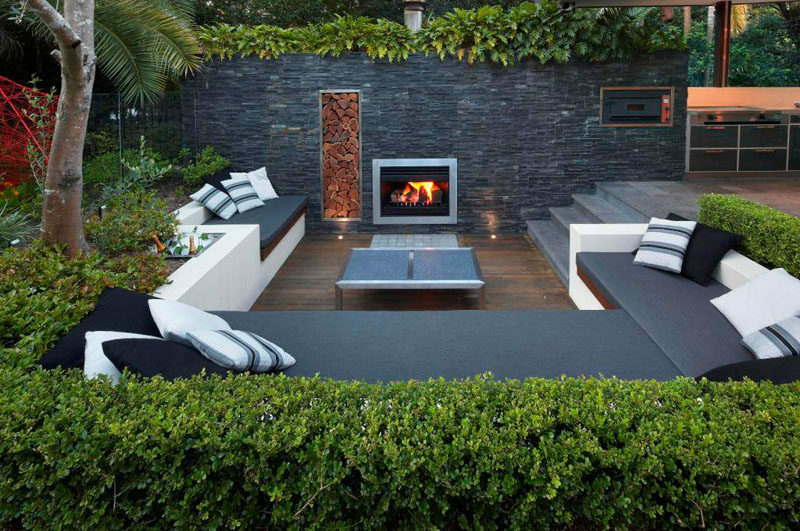 Concrete benches covered in pillows surround a large fire pit that would throw off enough heat to let conversations flow late into the night. See more photos of this project, here. Interior design by Patricia Urquiola. 6. Cozy cushions and the square fireplace in this built in conversation pit would make for the perfect place to stargaze or peacefully enjoy a cup of hot chocolate. See more photos of this project, here. Designed by John Robert Nilsson. Photography by Åke Eson Lindman. 7. 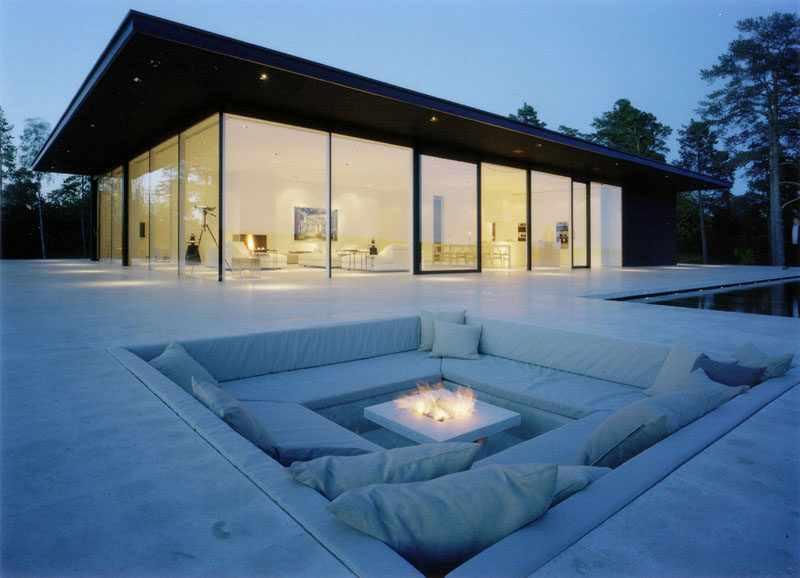 This high-tech conversation pit features comfy seating, a retractable screen for the projector and a built in fireplace. See more photos of this project, here. Designed by SVOYA Studio. Photography by Alexander Angelovsky. 8. 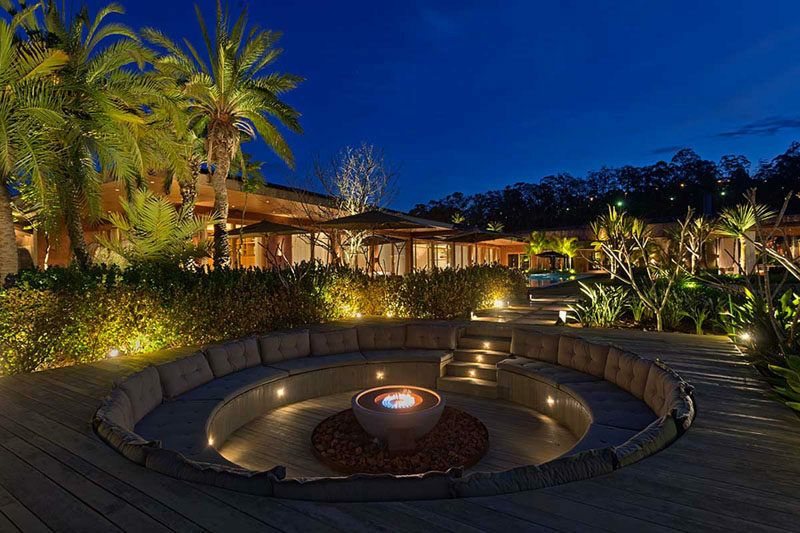 This sunken conversation pit tucked right into the deck has a fire pit, BBQ, and kitchen area, allowing entertaining and cooking to take place in the same spot. 9. This circular conversation pit surrounds the fireplace and is covered in cushions to provide a comfy place perfect for unwinding. See more photos of this project, here. 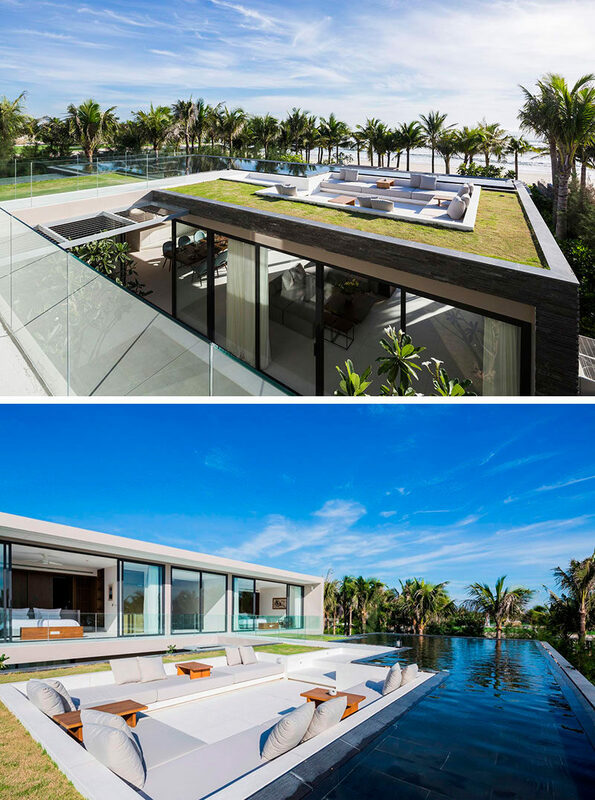 Designed by Saraiva + Associados. Photography by Gustavo Xavier. 10. 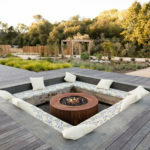 Made of stone, concrete, and cushions, this conversation pit, complete with a fireplace, creates an intimate spot for connecting with friends or relaxing on your own. See more photos of this project, here. 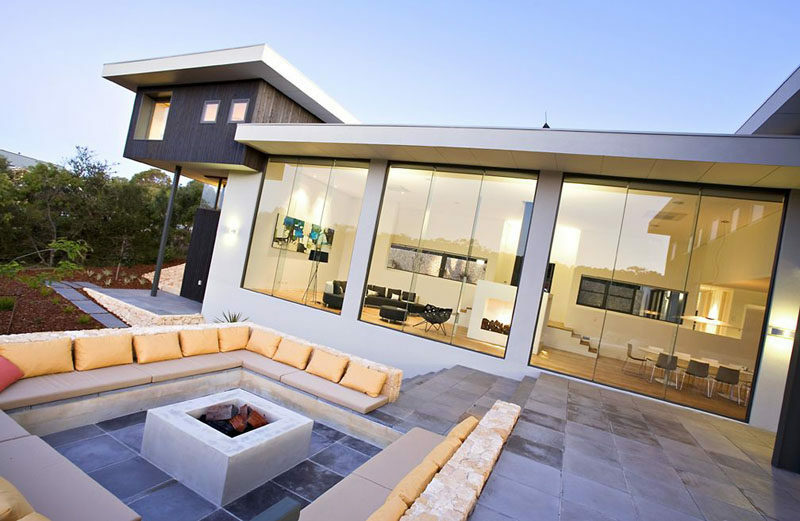 Designed by Dane Design Australia. 11. This rooftop conversation pit is at the same level as the pool to let swimmers get in on the conversations too. See more photos of this project, here. Designed by MIA Design Studio. Photography by Hiroyuki Oki. 12. 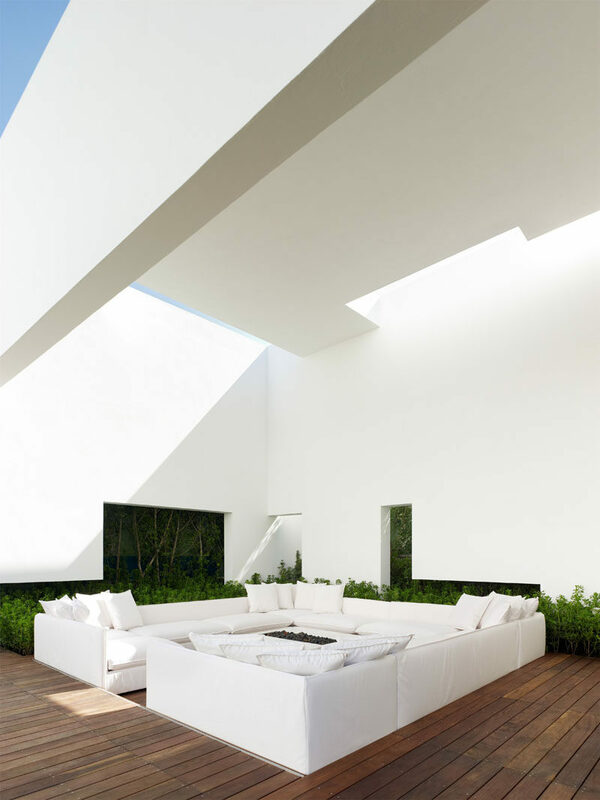 All white furniture in this sunken conversation pit, coupled with the white of the house keeps the space looking clean and modern, while the greenery and wood keep it connected to nature. Designed by Miguel Angel Aragones. Photography by Joe Fletcher. 13. 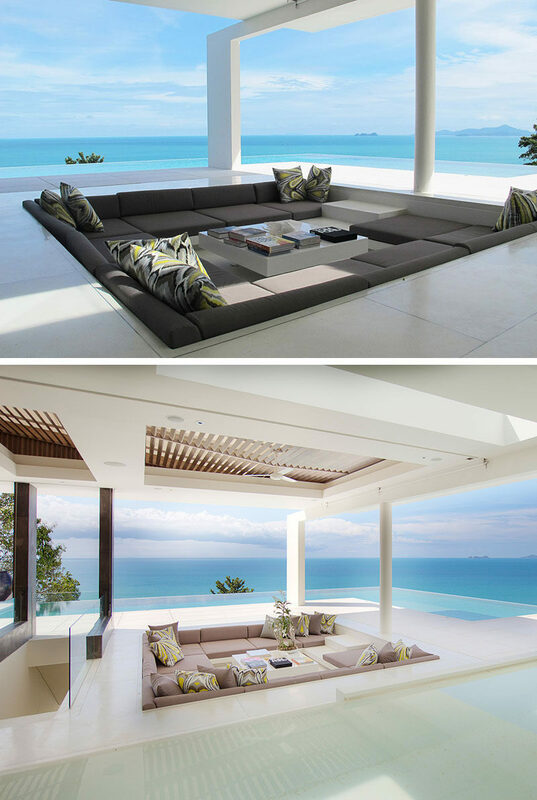 This outdoor conversation pit is surrounded by both an infinity pool and the ocean to allow for complete and utter blissful relaxation. 14. 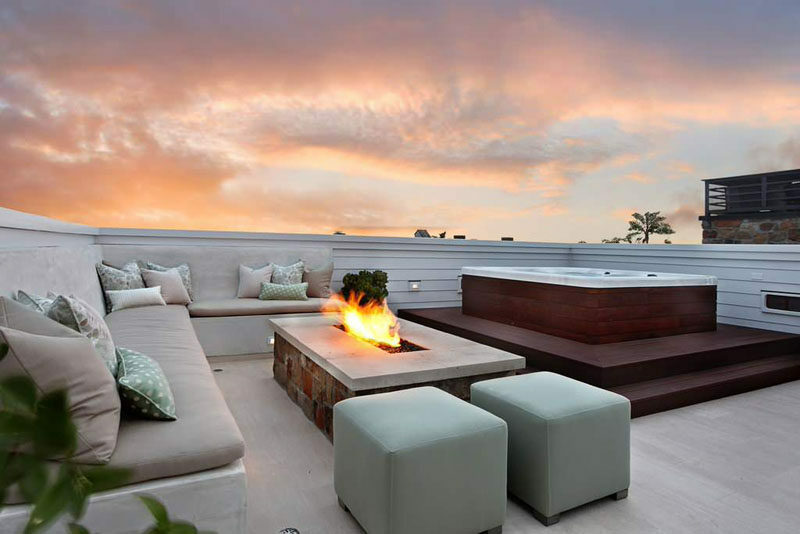 This built-in rooftop conversation pit features a hot tub and fire, perfect for chilly nights. Designed by Patterson Custom Homes. 15. 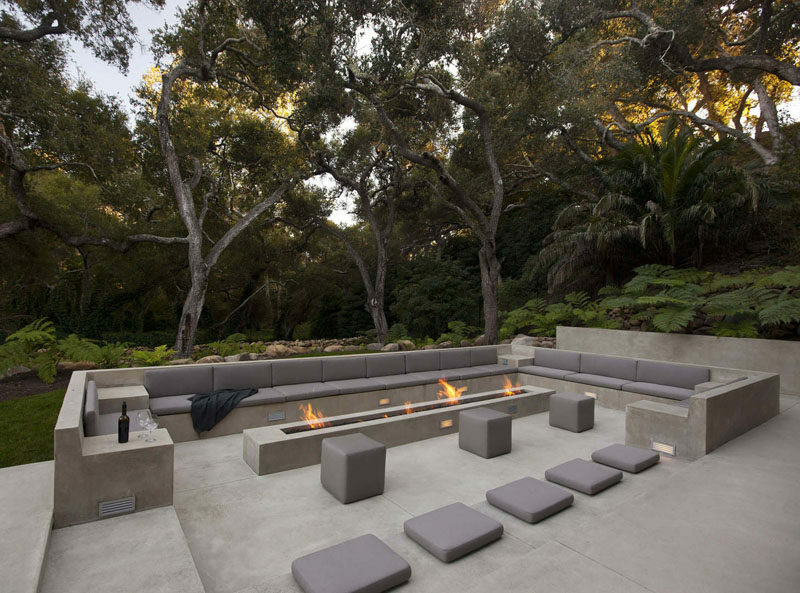 This outdoor concrete living space contrasts the lush greenery surrounding it and makes it feel extra modern. Designed by Steve Hermann. Photography by William MacCollum.